Is You Me, the new collaboration between Quebec choreographer Benoît Lachambre and dance artist Louise Lecavalier opened Saturday night at Usine C. The second work co-created by the two artists, after 2006's I is Memory, is not only a stunning piece of dance but also one of the best examples of the integration of dance and video I've seen in a long time. Developed over the last two years, in collaboration with video artist Laurent Goldring, and musician Hahn Rowe, the work consists of the two dancers on an all white stage, in the midst of a kinetic, colourful, and visually riotous series of video projections. Abstract in nature, the projections appear to be composed live (though the program notes indicate they are prerecorded) and resemble a drawing created in a simple computer program like Microsoft Paint. Lines are drawn around and across the dancers' bodies. Spaces are filled with colour and imitate human forms, animals, and objects, though the way they are rendered every image is suggestive, rather than concrete. One of the things I often find frustrating about the integration of dance and video is that the artists often don't take full advantage of the possibilities available by merging the two forms-- namely creating a genuine interaction between them. Dancers have a degree of precision in their training that allows them to interact with prerecorded images in a way that actors simply cannot, which is why I always find it maddening when choreographers employ video simply as a visual backdrop for their work, rather than an integrated element of the performance. Is You Me is an ideal example of how to work with these two forms together. Far from being a simple background for the action, the video design in this piece is truly integrated with the movement to the degree that you occasionally forget you are watching dance, and start to feel like you are watching a computerized video projection in which the dancers are shapes being drawn along with the rest of the images. It's fitting that Goldring is credited as co-creator along with Lachambre and Lecavalier, as his design for the piece functions like a third dancer on stage. 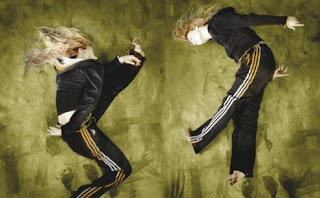 The all white space and deceptively simple set design brings the dancers and the projected images into the same visual plane and allows for a whole series of simple but brilliant trompe-l'oeil's in which their bodies are morphed, turned inside out, and wrestled into one visual paradox after another. Lecavalier is perhaps best known as the blonde-dreadlocked power house who danced with La La La Human Steps for eighteen years. Along with choreographer Édouard Lock, she helped develop that company's lighting-fast choreographic aesthetic and is maybe best known for her signature "barrel jump" (think pirouette turned sideways) one of the great defining images associated with the company. Now, nine years after leaving La La, she's turned her efforts to exploring a slower style of movement. She says in the program notes that speed and slowness are similar in that they both can indicate a lack of connection with our primal driving forces, though when pushed to the extreme they can transform our perceptions and relationships to time and our own bodies. Lest I make it sound like the choreography resonates with some kind of Butoh-like glaciality, I should be clear that both Lechambre and Lecavalier (who turns fifty this year!) both move fast, though there's a greater contrast between fast and slow movement than she was known for in the past. It's amazing to see someone who has had such an incredible career with one of the best known international dance companies in Canada continuing, not just to work in the medium, but to push visual and choreographic boundaries that artists who are just starting their careers are dabbling in.